Pull up to a delightful dinner with family and friends on the Better Homes and Gardens Azalea Ridge 5-piece Dining Set. 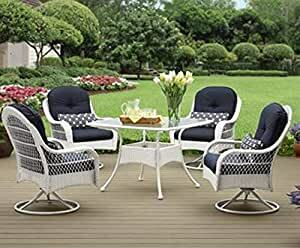 This attractive all-weather Wicker dining set includes four cushioned dining chairs and a tempered Glass dining table. From the sturdy Steel frames to the comfortable swivel action dining chairs, the Azalea Ridge Dining Set lends a touch of casual elegance to any outdoor setting. We sell on Amazon to make it convenient for buyers to shop one place and to earn a profit. We purchase items from a number of different sellers to get the best price available and sell them for enough to pay Amazon fees and clear a profit, so our price may not be the lowest price available.